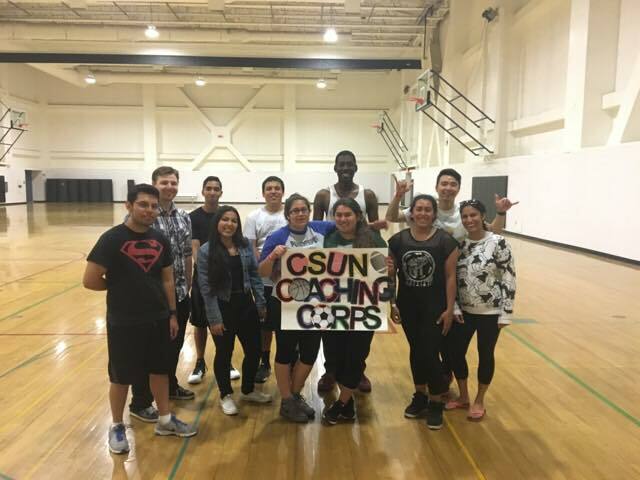 CSUN students returned this semester not just as students but also as coaches. These students are coaches through the non-profit organization, Coaching Corps. This organization originally began as Team-Up for Youth in the Bay Area. In 2002 however, the foundations that created Team-Up for Youth saw a need that under served communities had for money and coaches, according to Marketing and Communications Director Michael Rohn. The new organization, Coaching Corps, would not only provide funding for struggling sports programs but would also provide volunteer coaches. Fast forward to 2017 and Rohn claims Coaching Corps has expanded to five states and 10,000 coaching positions filled. “In 2016, we were able to provide 27,000 kids coaches for their teams with plans to help 65,000 by 2021,” said Rohn. The training that Coaching Corps provides, covers everything from how to interact with the kids to running practices. The Coaching Corps also provides a staff number to help coaches throughout the season by answering any questions or worries. MENTOR reports that The National Mentoring Partnership found that at-risk youths who receive mentoring are more likely to attend and graduate college. If an organization like this didn’t exist not only would the kids of these struggling communities lose the experience but the volunteers as well. “It is tough in the beginning but as soon as the kids see your commitment they start to open up,” said coach and Regional Director, Priya Sodha. Sodha has worked with the Coaching Corps for the past four years teaching dance. The experience is not only beneficial for the kids but the volunteer coaches as well, said Sodha. A former coach for the Coaching Corps, Mariela Navarro, agrees that the experience was fun and great for resumes. Navarro had a slightly intense experience because she had signed on to be an assistant coach for soccer at Northridge Park. On the day of her first practice she was told that she would in fact become the head coach. With no prior experience she was under stress. Her second experience with the Coaching Corps was when she took the coach position at her local YMCA. There she was able to create her own cheer program that would go on to coach 15 girls. “Not only is this a great volunteer experience but it helps on resumes, I even got two job offers because of the program,” said Navarro. Coaching Corps provides an invaluable service to kids of struggling areas by giving them sports and coaches to develop themselves however, the future looks rocky for Coaching Corps because of potential government policies. President Trump’s budget has proposed to cut funding for after-school programs, which could impact Coaching Corps and other similar organizations. “Our programs will lose funding to provide sports programming for all youths or programs will be understaffed,” said Sodha. However, the changes will not go into effect until next year and we are always looking for more coaches, said Sodha.